So, I’m working a little backwards here. Yesterday I brought you a delicious pie you can serve for Thanksgiving dessert and today I am bringing you two sides. 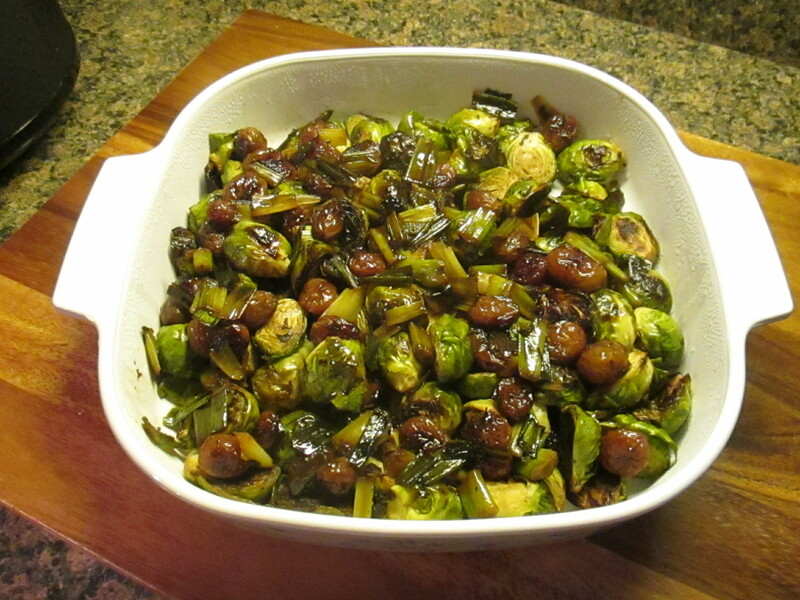 A roasted Brussels sprouts dish and homemade cranberry sauce. Come back on Sunday for Slow Cooker Sunday where I will tell you how I slow cooked a turkey breast – see, definitely working backwards! I know Brussels sprouts is not a favorite vegetable for many, but, I think the reason is because they are not preparing them the best way. Yes, they have a bitter flavor, just like broccoli rabe, but, when you season and roast them in the oven they take on a whole new flavor. Even the little charred sections taste good. And, they get perfectly tender. The recipe I recently tried called for them to be roasted in the oven and then topped with a glaze made with grapes, honey & scallions… YUM! I can’t wait to make it again and I am pretty sure it will make any Brussels sprout skeptic think twice about that vegetable that looks like a baby cabbage. 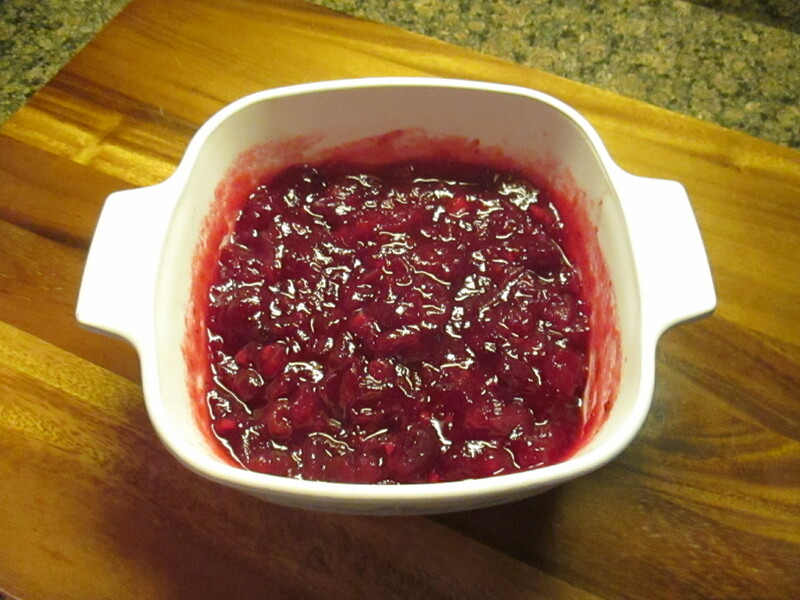 I grew up eating cranberry sauce from a can, not the whole berry sauce one, but, the jellied version. It’s weird, I won’t eat the whole berry one from a can because I feel like it’s too fake but I will eat the jellied version. Yes, I will still eat it with my turkey and stuffing. I don’t really know what prompted me to try making cranberry sauce myself since I was content with the can stuff, but, I’ve used the same recipe now for quite a few years and it’s one of my favorite things about Thanksgiving. I look forward to a sandwich with leftover turkey warmed up with melted cheese (preferably provolone) and topped with cranberry sauce every year after Thanksgiving. I am dreaming of it now as I type… LOL! So, what is so special about this sauce? I think it’s the simplicity of it. There are no out of the box ingredients. It’s simply a bag of fresh cranberries, sugar, water, fresh ginger, orange zest, a cinnamon stick, ground cloves and salt. I tried getting a little fancy one year, but, it just didn’t top the simple yet delicious taste of this cranberry sauce. Make a few days before you intend to use to really get the best flavor. So, I hope these two dishes will make their way to your table, or, they have given you ideas of something else to try. Place a baking sheet on the middle rack of the oven and preheat to 450 F.
Toss the Brussels sprouts with the olive oil, 1/2 teaspoon salt and a few grinds of pepper in a large bowl. Spread them on the hot baking sheet and roast, tossing halfway through until tender and charred in spots, 20 to 30 minutes. While the Brussels sprouts are in the oven…. Melt the butter in a large skillet over medium-high heat. Add the grapes and thyme and cook until the grapes starting to burst, stirring occasionally. Add the scallions and honey. Increase the heat to high and bring to boil, then reduce the heat to medium-low and let simmer until the juices thicken and the grapes are glazed. Season with salt and pepper. In a medium saucepan combine 1 cup of water with the sugar, cinnamon stick, ginger, orange zest, salt and cloves. Cook over medium heat, stirring, until the sugar dissolves. Stir in the cranberries and bring to a boil, then lower the heat to medium-low and allow to simmer, stirring until slightly thickened.